In the current digital age, you will extend your brand’s reach much farther if you supply leads with the tech they need and want. USB flash drives are a common giveaway, and you can get more creative with stylus pens that gracefully jump the gap between traditional and digital medias or a smart phone wallet, which greatly appeals to younger audiences, especially college-age audiences. You might also consider branding your promotional items with your social medias to encourage internet-savvy clients to interact with your business online on the daily! At trade shows and expos, clients are bombarded with promotional giveaways that are often inexpensive and in large quantities. This is practical when trying to reach a wide audience whom you can’t actually guarantee will be suitable leads for your brand. However, you will want to consider creating giveaway “tiers.” Continue offering promotional pens or stress-relievers to all passers-by, but reserve big-ticket items like apparel, tote bags, or umbrellas for those who are willing to provide contact information. Another great idea is to incentivize leads to spread the word for you. Offer someone a drinkware item or a hat when they refer someone else to your booth. Take the outbound approach and reach out to individuals and companies you would like to work with first! Make an introduction, then follow up by mailing them a high quality promotional gift that is significant in some way. This can be something like a wine gift set, a nice mug set, a laptop bag, or a sports duffel bag. Choose something that connects with your brand or relates to something you’ve discussed with this potential lead beforehand for a more personal touch. 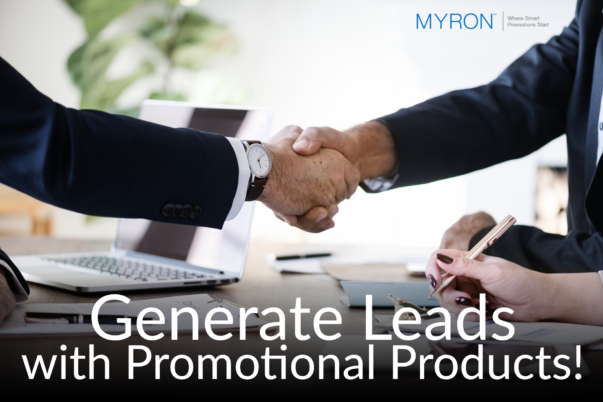 Once your sales team is just about to close a deal with a lead, encourage them to send a high-end promotional product like the suggestions above. This strategy makes for a good show of faith with a lead. Bonus points if you can find a promotional product that relates specifically to your brand (or theirs!). As we discussed in Step #2, you should aim to incentivize others to generate leads for you. This is especially powerful when the referral comes from a client with whom you’ve already worked and who already trusts your brand. You can either promise them a promotional product as a reward for a referral, or send it afterwards as a surprise thank you! Lastly, but most importantly, you’ll always want to make an impression. To do this, we recommend building your own gift set with promotional products that make sense for your brand. Invest in multiple branded products to create a stunning, complete gift box that is sure to woo your potential leads. For the potential lead, a set of items makes it easier for them to envision making use of them (and thus remembering your brand) in the future than a standalone item might. As an example, a startup tech company might want to create a set that consists of a t-shirt, earbuds, and sunglasses. The headphones make sense considering the industry, while the t-shirt and sunglasses appeal to a younger audience who would be interested in working with them. Another combination that works for any industry is a pen, notepad, and travel mug for the perfect productive pack. Keep in mind, there’s no need to purchase expensive items to create a gift set! When it comes to how to generate leads, what matters most about a gift set is appealing presentation and the creativity and thought put into the selection. We hoped this blog gave you some smart ideas on how to generate leads! Let Myron help you find and create the perfect promotional products for your brand. With high quality, affordable products, and a 100% satisfaction guarantee, we’ll help your business generate promising leads!